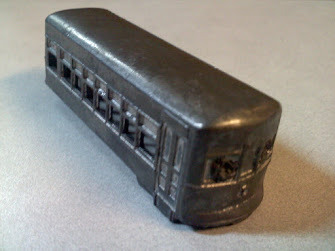 I just received this very nice solid N Scale Birney trolley, but unfortunately I know nothing about it. It is a heavy metal molding and artfully done. I wish I knew where and when it was originally made and if it was designed with any particular power source in mind. I really would like to see it on the layout running because it is much to high quality to be relegated to becoming a diner in the town. If you know anything about this guy, I would love to hear it. And if you click on the picture, you will be taken to my gallery with more pictures and some measurements and comparisons to other N Scale trolleys.